Mark A.M. Ashley House. From boudless.uoregon.edu. 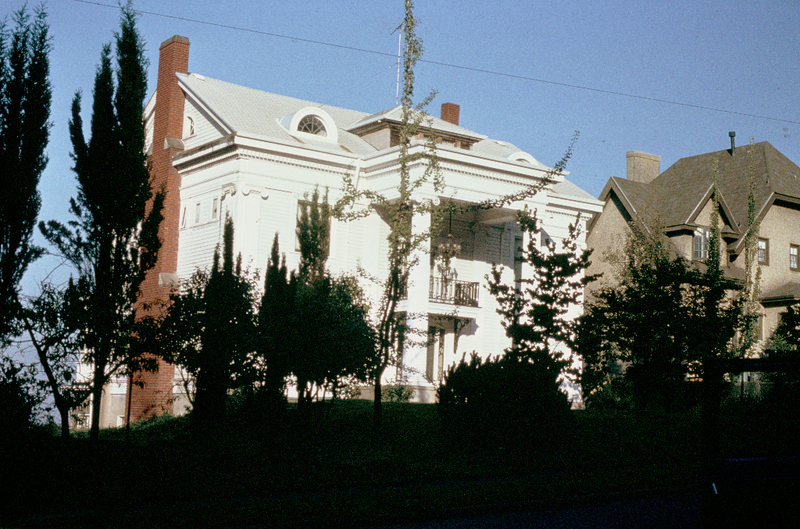 Image by Oregon State Historic Preservation Office. Classified in the Georgian style, this home was designed by Henry C. Dittrich and built by Hiram E. Wood in 1913. Other images can be found HERE. and HERE. The latter contains images taken in 1914 - just after completion. They're lovely. The Ashley residence is an exemplary embodiment of a Georgian-style period house. 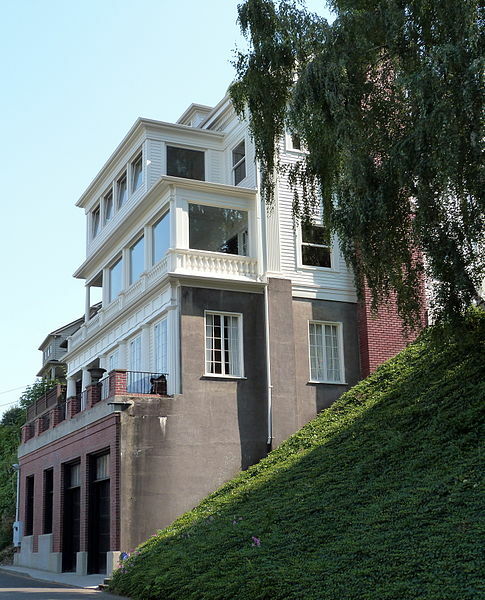 Built in 1913 by Henry C. Dittrich, architect, for Mark A. M. Ashley, a prominent early Portland banker, its general condition today is exceptionally sound and stable, permitting its continued use as a single family residence. in a gable-style roof with a hip-roofed dormer extending axially fore and aft. A red brick chimney situated on the left side of the house extends upwardly from below Westover to above the roof ridge. The salient features of the house as originally constructed are described in the text and photograph of an article appearing in the January 25, 1914, issue of THE OREGONIAN. As disclosed in the article and enclosed photographs, the front and sides of the house exhibit the classic hallmarks of Georgian design: rigid symmetry, an axial entrance, geometrical proportions, sash, windows, and a raised (at least partially) basement. Missing only^ are the hipped ends of the main roof characteristic of most Georgian designs. A large portico supported at the front by two large Ionic columns and surmounted on three sides by a balustraded widow's walk protects the front entrance and overhanging balcony, the latter being surmounted by its own wrought-iron railing. Located behind each column and at the four corners of the house are equally large Ionic pilasters. Poised above each pair of front windows is an eyebrow window protrudingin dormer-like fashion from the roof plane. A second pair of eyebrow windows appears in the rear roof plane. The entire exterior, including siding, columns, pilasters, and other trim, is of cedar painted white and is in good sound condition. The capitals on the columns and pilasters are of horsehair-impregnated plaster. salient features of the rear of the house are seen to include the red brick facade of the garage level, the balustrade, Doric columns, and French windows of the terrace level, the balustrade, Tuscan columns, and partially glass-enclosed observatory porch of the Westover level, and the two enclosed sleeping porches of the first level above Westover. Alterations to the rear include the removal of the balustrades at the terrace and Westover levels, the replacement of the multi-paned windows of the observatory porch with large single-paned view windows, and the removal of the two sleeping porches. remains fully operational, rising the full five stories in its own reinforced concrete shaft. Moreover, the attic, encompassing about 1,200 square feet, has been finished to provide relatively comfortable, yet temporary, living quarters. All of the alterations to the house are thought to have been made between 1961 and 1975.
reconstruction of the main staircase (some balusters and rail sections were saved). The front of the house was redetailed (new capitals and dentils) and repainted in 1975. The remainder of the restoration is slated for completion over a period of years. embodiment of a Georgian-style period house, displaying a successful marriage of the decorative vocabulary of the Georgian period with the scale, site orientation, and style of the period house. The facade is of classic Georgian design incorporating accurately proportioned and detailed columns, pilasters, capitals, and entablature of the Ionic order. This symmetry and style is carried around to the sides of the house as well. The facade is 44 feet wide by 25 feet high, and the two front columns are over 18 feet high and over 6 feet around at their base. As far as can be determined, the details of the facade follow precisely the proportions of the Ionic order as set down by Vignola. matters, founding the Tenet Mortgage Company which exists to this day. Mr. Ashley was married in 1889 to Mabel W. Willis, a daughter of Parrish Lovejoy Willis, a prominent Portland attorney. Mr. and Mrs. Ashley moved into the house upon its completion and lived there until their deaths four months apart in 1939. They had two sons, Willis S. and Roscoe G., both of whom remained active in family financial affairs until their deaths in 1963 and 1947, respectively. Roscoe was the last member of the Ashley family known to have lived in the house. Roscoe 1st son, Robert N., continues the family interest in financial matters as the current president of Tenet Mortgage Company. During his lifetime, Mr. Ashley was noted for his continuous connections with the interests of Portland and his devotion to the operation of a business that was a prominent feature in the banking circles of the day. He was recognized for his keen perception and honesty of purpose as well as his interest in and support of numerous projects for the general good of the people of Portland. directories as a practicing architect T little is known of his other works except for a brick and frame church at the northeast corner of S.W. Tenth and Clay in Portland that he is rumored to have designed. The builder of the house is thought to have been Hiram E. Wood of Portland.